I recently created a few buffet and centerpiece floral arrangements for my friend, Angelynn, who is a caterer here in the Kansas City area. 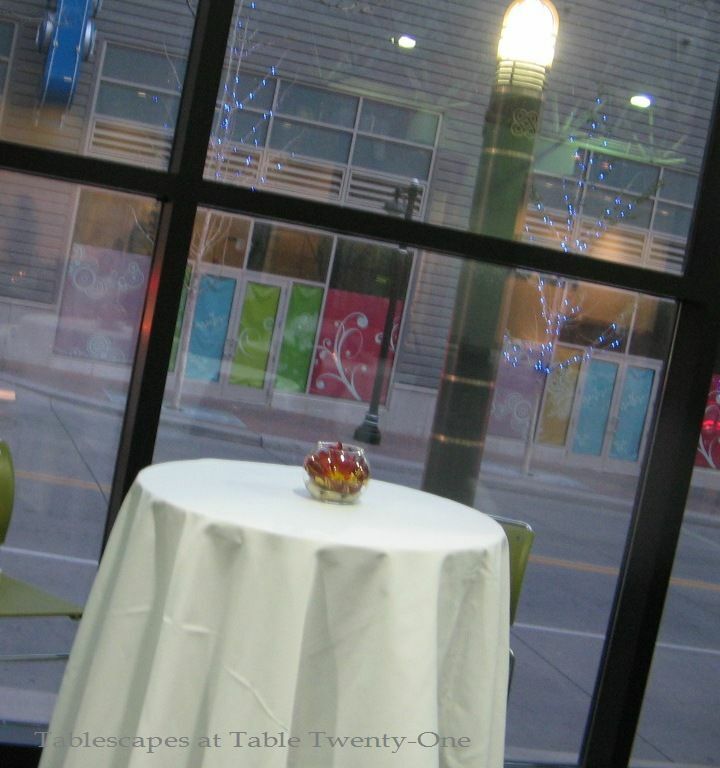 She wanted something with autumnal colors but appropriate for a business occasion at the KCPL Building in Kansas City’s Power & Light District. 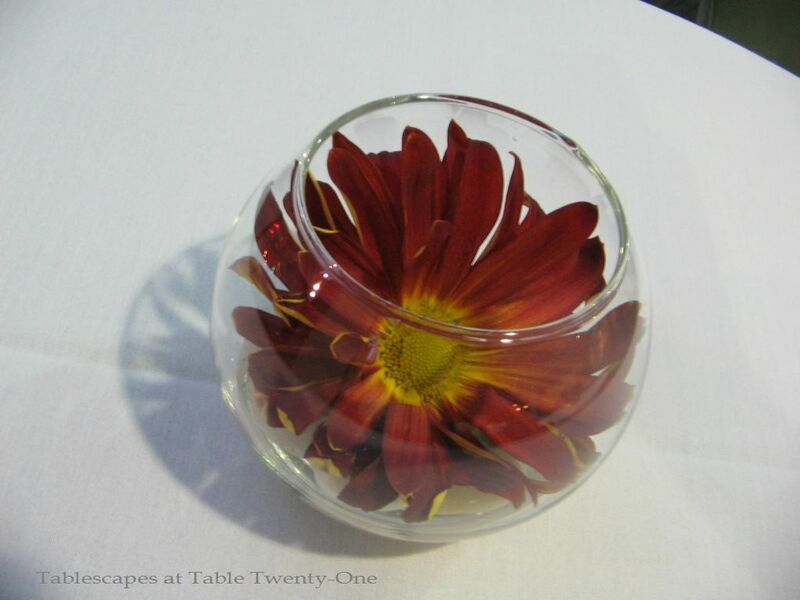 All arrangements were created in clear glass cylinders of varying sizes. On the guest sign-in table, this asymmetrical arrangement of fresh mums, leucadendron, and a few curly willow tips was just right. Votive candles and smooth black river rock help to extend the circumference of the arrangement. There were several areas of soft seating around the room. 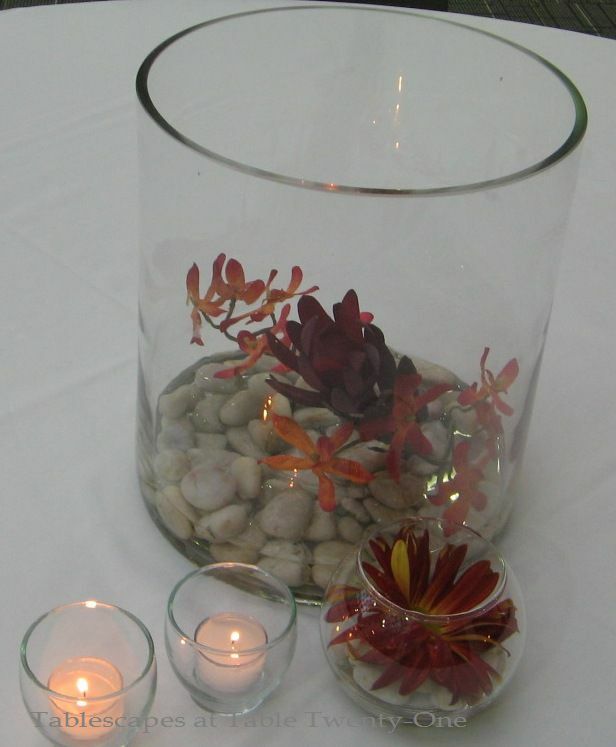 This is the arrangement as guests entered the reception space using a 39″H clear glass cylinder. Six-foot fresh curly willow is paired with tall stalks of leucadendron and dendrobium orchid stems anchored by greyish-white smooth river rock. The river rock is further extended onto the table, peppered with votives and orchid blossoms. Another soft seating area on the other side of the room got a variation on the theme of the entry piece. This cylinder is created by submerging stalks of leucadendron and orchid stems, once again anchored with river rock and surrounded by votives. Tip: Both orchids and leucadendron can survive without water for several hours, so if you don’t want the burden of drying out tall floral vessels, feel free to skip the wet stuff! High boy tables along the window areas have a simple fall mum in a clear glass globe with a few river rocks for added interest and texture. These definitely must have a bit of water to survive! The buffet arrangements are comprised of tall glass cylinders with lots of 6-ft. fresh curly willow, a few stalks of leucadendron, and two 6-ft. faux orchid stems anchored with river rock for counterbalance and visual interest. On the guest tables, two different but complementary centerpieces using the clear floral vessels, orchids, mums, leucadendron and river rock with a couple of votives. I did add a couple of quarts of water to these arrangements after getting everything else on the table to reflect the votives dancing nearby. I am pleased to join the busy Style Sisters for Centerpiece Wednesdays! How beautiful! I bet they were impressed.